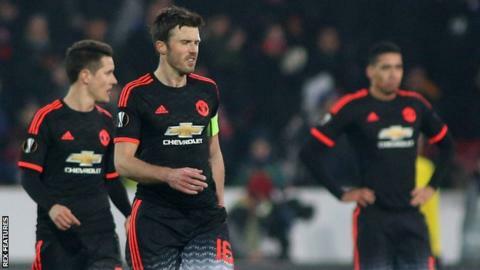 Manchester United produced another underwhelming display as they lost to Danish side FC Midtjylland in the first leg of their Europa League last-32 tie. United were without a number of injured players, including Wayne Rooney, and lost David de Gea in the warm-up. They took the lead through Memphis Depay's shot but Sergio Romero, who stepped in for De Gea, was unable to prevent Pione Sisto equalising. United's Jesse Lingard hit the bar before Paul Onuachu struck the winner. After losing to Sunderland 2-1 on Saturday, the Red Devils are six points shy of the top four in the Premier League, leaving qualification for next season's Champions League very much in the balance. Winning the Europa League could represent their best chance of reclaiming a place in Europe's elite club competition, but if they are to do that they will have to be much better than they were against opponents who had not played for 71 days because of the Danish winter break. That includes in the second leg of this tie, which is at Old Trafford in a week's time. Midtjylland were only formed in 1999, the year United won their famous Treble, but what they lack in history they made up for with application and ability. With 13 first-team players out and facing a side whose analytical tactical approach makes them a serious threat from set-pieces, United suffered a major setback when goalkeeper De Gea injured himself in the warm-up. That meant a first United start in four months for Romero, but the Argentine proved an able replacement with three good saves. One was a block to deny Vaclav Kadlec, who ran through unchallenged, just 56 seconds before United broke the deadlock through Depay's close-range finish from Lingard's cross. Romero also produced a superb one-handed diving stop to keep out a powerful goalbound header from Onuachu in the second half. Between those two saves, he could not stop Sisto pulling the hosts level with a shot that found the net via the shin of Chris Smalling. Romero was equally powerless to keep out Onuachu's winner - a low drive after the substitute beat Juan Mata on the edge of the box. A knee injury means United face a six-week insight into life without captain Rooney - an absence that could become permanent if reports of a move to China prove correct. United have refused to comment on speculation about the striker's future, but his absence allowed Depay to make his first start since Boxing Day and gave Anthony Martial the chance to start up front. Depay, the top scorer in the Dutch league last season prior to his £31m move to Old Trafford, had scored once in his previous 20 United appearances. And while his display in Denmark was not a notable improvement on past performances in a United shirt he was able to add a goal to his modest tally of goals for the season, which now stands at six. But the Dutchman, like the rest of the United team, offered little in the second half as the home side came back to win. Martial, who has operated primarily on the left since joining the club for £36m in September, was largely anonymous in his central role. Lingard struck the bar with a volley while the score was 1-1, but United rarely threatened as the clock ticked down. United travel to Shrewsbury for an FA Cup fifth-round tie next Monday, followed three days later by the return leg against Midtjylland at Old Trafford. Match ends, FC Midtjylland 2, Manchester United 1. Second Half ends, FC Midtjylland 2, Manchester United 1. Attempt blocked. Pione Sisto (FC Midtjylland) right footed shot from outside the box is blocked. Chris Smalling (Manchester United) is shown the yellow card for a bad foul. Marco Ureña (FC Midtjylland) wins a free kick in the attacking half. Attempt blocked. Jesse Lingard (Manchester United) right footed shot from outside the box is blocked. Assisted by Anthony Martial. Attempt missed. Michael Carrick (Manchester United) header from the right side of the box is too high. Assisted by Andreas Pereira with a cross following a corner. Corner, Manchester United. Conceded by Filip Novak. Attempt blocked. Jesse Lingard (Manchester United) right footed shot from outside the box is blocked. Assisted by Donald Love. Attempt missed. Daniel Royer (FC Midtjylland) right footed shot from outside the box is close, but misses the top right corner. Assisted by Marco Ureña with a headed pass. Foul by Andreas Pereira (Manchester United). Ebere Paul Onuachu (FC Midtjylland) wins a free kick in the defensive half. Attempt missed. Marco Ureña (FC Midtjylland) right footed shot from outside the box misses to the right. Assisted by Kristoffer Olsson following a set piece situation. Substitution, FC Midtjylland. Daniel Royer replaces Vaclav Kadlec. Jesse Lingard (Manchester United) is shown the yellow card for a bad foul. Ebere Paul Onuachu (FC Midtjylland) wins a free kick on the left wing. Attempt missed. Pione Sisto (FC Midtjylland) right footed shot from the right side of the box is just a bit too high. Assisted by André Romer. Foul by Vaclav Kadlec (FC Midtjylland). Goal! FC Midtjylland 2, Manchester United 1. Ebere Paul Onuachu (FC Midtjylland) right footed shot from outside the box to the bottom left corner. Assisted by Marco Ureña. Michael Carrick (Manchester United) wins a free kick in the defensive half. Foul by Marco Ureña (FC Midtjylland). Corner, Manchester United. Conceded by Pione Sisto. Substitution, Manchester United. Morgan Schneiderlin replaces Ander Herrera. Attempt blocked. Jesse Lingard (Manchester United) right footed shot from the centre of the box is blocked. Assisted by Ander Herrera. Attempt missed. Vaclav Kadlec (FC Midtjylland) right footed shot from outside the box is close, but misses the top right corner. Assisted by Kian Hansen. Attempt missed. Pione Sisto (FC Midtjylland) right footed shot from the centre of the box is close, but misses to the right. Assisted by Marco Ureña. Substitution, FC Midtjylland. Marco Ureña replaces Rilwan Hassan. Offside, FC Midtjylland. Kristoffer Olsson tries a through ball, but Vaclav Kadlec is caught offside. Memphis Depay (Manchester United) wins a free kick on the left wing. Foul by Kian Hansen (FC Midtjylland). Foul by Michael Carrick (Manchester United). Rilwan Hassan (FC Midtjylland) wins a free kick in the defensive half. Attempt saved. Ebere Paul Onuachu (FC Midtjylland) header from the centre of the box is saved in the top right corner. Assisted by Kristoffer Olsson with a cross. Substitution, FC Midtjylland. Ebere Paul Onuachu replaces Martin Pusic. Donald Love (Manchester United) is shown the yellow card.